There are an awful lot of free games on Android, but few of them are really worth your time. Inevitably when a huge success comes along, like Angry Birds, there will be copycats. There can be no doubt that Pandas vs Ninjas is exactly that. The aim is to hurl pandas instead of birds and you are toppling structures to vanquish ninjas instead of pigs, but the presentation and gameplay is virtually identical. Hurl Those Pandas, Squash Those Ninjas! 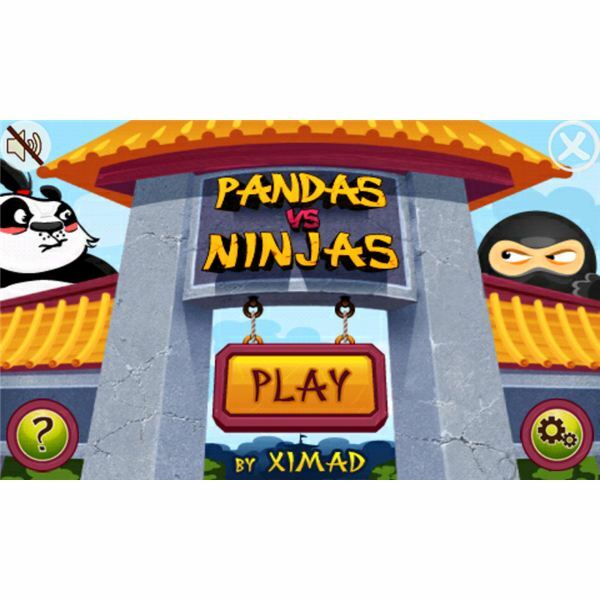 There are various versions of Pandas vs Ninjas in the Android Market and they are all available for free. The basic gameplay is always the same. You have a number of levels to complete by hurling pandas at an unsteady structure with ninjas hiding in it. 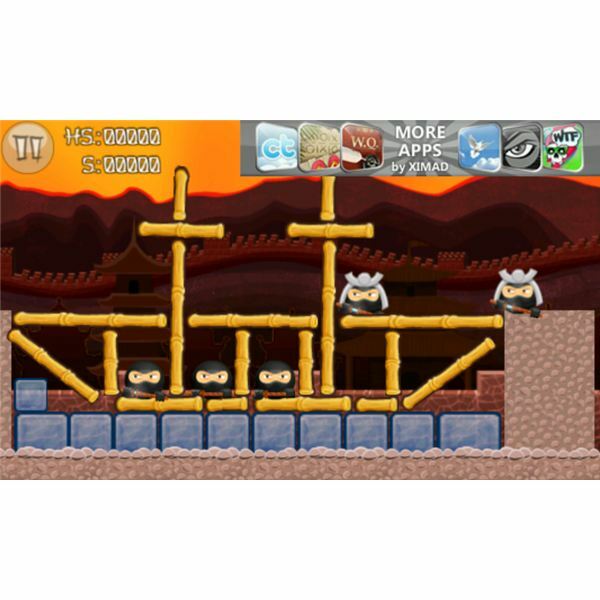 Once you manage to knock out all the ninjas, the level is done and you can progress to the next one. The gameplay is obviously modeled on Angry Birds and you swipe your finger back to control the power you are going to throw the panda with and then let go to release. As the game progresses you’ll get some extra panda types, such as exploding pandas and zooming pandas. The secondary ability is always triggered by a tap on the screen after you have released the panda. Sometimes you control a giant panda who hurls his smaller brethren into battle and sometimes it is a kind of bamboo catapult (the catapult seems to have a greater range). If you manage to hit a ninja with enough force, you’ll see stars around his head and he’ll disappear from the playing field. You can also earn extra points by destroying the structures. They are made up of various materials such as wood, glass and stone — each with its own unique properties. As you’d expect, the levels start out very easy and gradually ramp up in difficulty. The learning curve is gentle and this shouldn’t really prove too challenging for most people. 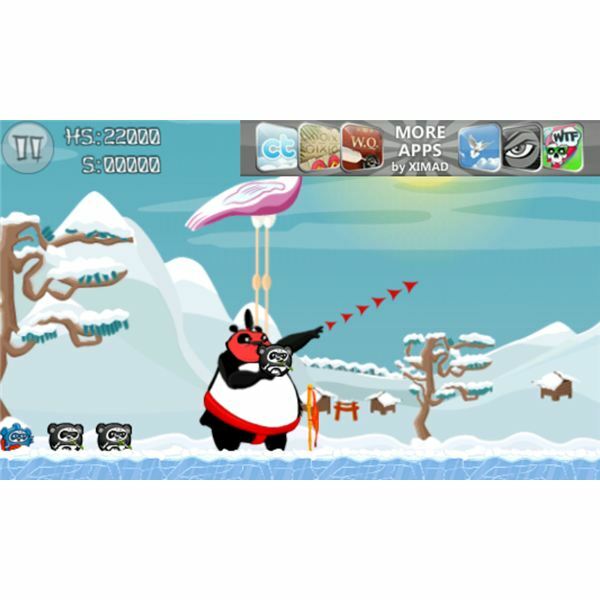 Pandas vs Ninjas is such a close copy of Angry Birds, that it does have the same addictive hook, but it lacks the polish. Occasionally the structures will react in unexpected ways or your panda will fly off the screen at a surprising rate. The physics just don’t feel quite right. Firing lofted shots is very difficult for some reason and, if you fire your panda high into the sky, you’ll often find that he never comes down again. The other problem is occasional lag. Navigating the menu is slow and there are infrequent laggy moments when you are about to fire your panda, which can make things a bit frustrating at times. It mostly runs fairly smoothly, it’s just a bit rough around the edges. Another irritation is the presence of ads, not just in the menus and loading screens, but during the gameplay as well. They sit at the top of the screen so it’s generally quite easy to avoid accidental taps, but any touchscreen game with ads on the screen is going to lead to the odd slip of the finger. An advert loading while you are in the middle of the game is very annoying. To be fair they are offering a lot of gameplay for free so you can’t complain too much about the ads. The art style of the game is quite cute. It is a cartoony, chunky kind of look with cutesy ninjas and pandas fighting to the death. The replication of Angry Birds extends to the menus and the level select screen looks exactly the same (with a medal system instead of stars). The music track is fitting enough and the sound effects are amusing for the first thirty seconds. You’ll probably find yourself turning them off quite quickly but the trouble with that is that they do provide some feedback about when you’ve successfully hit a ninja. The gameplay with the sound off is actually slightly tougher to follow and a bit less engaging. You’ve played Angry Birds and Angry Birds Seasons and Angry Birds Rio and gotten three stars on every level. If you reach that stage where you have completely exhausted Angry Birds then try Stupid Zombies. Once you’ve completed that too, it’s time to delve into Pandas vs Ninjas. It’s tough to give it a strong recommendation because it is a blatant rip-off and it doesn’t play as well as the original. Having said that, it is free, it is fun and it has the same addictive hook. 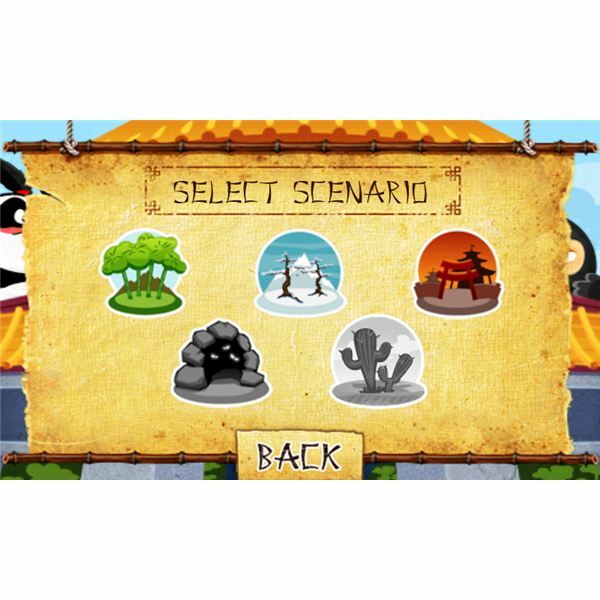 Screenshots taken by author from Pandas vs Ninjas on an HTC Desire.